Whenever two or more Charlotte Mason parents get together, especially those who are newer to the approach, there is sure to be some discussion of twaddle, and what it is, and more keenly, what it is not. None of us wants to admit that the books we adored in our own childhood might just be twaddle, and we don't appreciate the kill-joys who try to tell us otherwise. Although a trained teacher, I knew nothing of Charlotte Mason's methods. I ordered 'Home and School Education' and read it with interest; but I must confess to some scepticism. 'Children have no natural appetite for twaddle,' she had written in the chapter on Aspects of Intellectual Training. I underlined that sweeping statement; and in my mind I classified it along with a few odd ones I had heard at college'Children are not naughty,' and the rest. Experience had fast taught me that children are downright wicked unless they are kept so busy and interested that they have no time to think up any fresh devilment. I cannot possibly describe my bewildered, fascinated disbelief when the first batch of books arrived. Of them all, 'Plutarch's Lives' hit me hardest. Those long, measured periods in difficult language! Alison, at eleven, would not understand a word! How on earth was Robin going to assimilate 'Mankind in the Making' and 'The Spangled Heavens'? What was Charles going to make of 'Pilgrim's Progress'? Their eyes shone. They were not thanking God as a dutiful routine, but joyfully. They have retained their sense of delight and wonder. Those of us who plead for the reduction, or better, eliminationm of twaddle from your family's literary diet do so not because we are kill-joys, but because there is a deep, abiding richness to the quality of joy, delight, and wonder which comes from living books (and the rest of CM's methods), which is precisely what twaddle cannot truly give. But what are we to do, when we have not all grown up with living books? How does one learn to develop a taste for real books when we have grown up on cotton candy and pizza? The first step is in recognizing that not all reading is equal anymore than all foods are equal. It is not true that it doesn't matter what they read, so long as they are reading. This notion is a sort of a buzzword of our non-reading generation, but it really cannot stand up under scrutiny. Is it really just fine if a human soul spends an entire lifetime reading only about wimpy kids and heroes in underpants? It does matter, or we might as well merely all read cereal boxes and Disney picture books and nothing else (shudder. Disney picture books are truly among the worst). Let's conduct a little thought experiment. Let us imagine two groups of children. The children in each group have access to only two books for their first 8 years of life. Group A may have the 800 page 'Disney Princess Comics Treasury' and nothing else (no link, because, ugh). Group B will have only a complete collection of Hans Christian Anderson's original tales, perhaps this one: The Complete Fairy Tales and Stories , which is even unillustrated. Or we could substitute Aesop's, or Grimm's, or Jacob's, or even Pilgrim's Progress, so long as it a recognized work of literary value, a book everybody agrees is a living book. Each group will be read to from the assigned book and only the assigned book at least fifteen minutes a day, and in every other area will be treated precisely the same. Will there be absolutely no discernable difference between the language skills, the ideas and thoughts and imaginings of a child who has never read anything but Disney? The mind feeds on ideas, and twaddle is not sustaining. So please, let us dispense with the false notion that it doesn't matter what they read so long as they are reading. The next step is a little harder- how do we learn to detect twaddle? What manner of book will find its way with upheaving effect into the mind of an intelligent boy or girl? We need not ask what the girl or boy likes. She very often likes the twaddle of goody-goody story-books, he likes condiments, highly-spiced tales of adventure. We are all capable of liking mental food of a poor quality and a titillating nature, and no doubt, such food is good for us when our minds are in need of an elbow-chair; but our spiritual life is sustained on other stuff, whether we be boys or girls, men or women. "I do not know better how to describe the sort of books that children's minds will consent to deal with than by saying that they must be literary in character. A child of seven or eight will narrate a difficult passage from The Pilgrim's Progress, say, with extraordinary zest and insight; but I doubt if he or his elders would retain anything from that excellent work, Dr. Smiles's Self-Help! The completeness with which hundreds of children reject the wrong book is a curious and instructive experience, not less so than the avidity and joy with which they drain the right book to the dregs; children's requirements in the matter seem to be quantity, quality and variety: but the question of books is one of much delicacy and difficulty. After the experience of over a quarter of a century [The P.U.S. was started in 1891.] in selecting the lesson books proper to children of all ages, we still make mistakes, and the next examination paper discovers the error! Children cannot answer questions set on the wrong book; and the difficulty of selection is increased by the fact that what they like in books is no more a guide than what they like in food." *Whether or not somebody enjoys a book is no guide to determining whether or not it is twaddle. **** The opposite of twaddle includes books that are "Literary in character"- this is a bit harder for many of us to define. Another foe to simplicity in our era is the multitude of books about books. Personally I have almost a horror of this class of belles-lettres. We don't want elucidations, we want the classics themselves. Many people read notes and criticisms and commentaries and preliminaries and antecedents and never reach the original. It is as though a person bent on seeing Westminster Abbey were to stay listening to a tittle-tattle of the verger instead of seeing Westminster Abbey. Another evil of the time from which we should abstain is the plague of cheap editions. This reaches an acute crisis when it consists of a cheap edition of detached fragments of world's literature. I'm going to name some names here, although I realize that there is a danger of touching on somebody's favorite and thereby offending. The Junior Classic books, Childcraft, and the like, beyond the first couple of volumes (because the first one or two volumes are usually nursery rhymes, fables, and fairy tales which do stand alone), are 'detached fragments of world's literature.' Bill Bennet's Book of Virtues is also, to me, more like the tittle-tattle of the verger- the stories he chooses are good stories, but he introduces them with tittle-tattle, and sometimes rewrites them himself, and it is my opinion is that the result is rather flat and lacks the charm of the originals. "the Bible has this, among other marks of a classic, that its language has the power of attracting young minds," and it is deeply to be regretted, we think, that children should lose the delight of Bible stories as they are told in the Bible--should be given instead the reading-made-easy twaddle of some little book of Bible stories. Not even a Bible story told by "mother" herself will have for a child the rhythmic charm and pictorial power of the stories in Bible words. (from the Parents' Review, review of a Bible for children which used the Revised Version and was edited by omission, leaving out stories such as the one of Lot and his daughters). The literary mind is indeed rare. For a hundred who will read a book for what it has to tell or for amusement, only one perhaps will read it also for its literary value. The appreciation of good literature, for all our schools and universities, remains the possession only of a few. Yet, just as the average person can be trained to appreciate good music and art, he can also be trained to appreciate good literature. And it is in the nursery that the key to the palace of good literature is opened. The reason why so few people have developed the critical faculty with regard to reading is that so few have grown up in the company of good books--only good books--but have been allowed, while their minds were growing, to read any printed twaddle within the covers of a book or magazine. In the world of nutrition, many people these days have been trying the 'real food' approach, eating only whole foods without additives they don't recognize and can't pronounce. One of the interesting results those who try it discover is a new appreciation for the flavor of basic, unprocessed foods prepared simply. Another result (I admit one I found a little depressing) is that many of the over-processed foods one previously ate no longer taste good. One breaks one's strict diet regimen for a special treat only to discover it's no treat at all, but rather a slightly nasty, over-sweetened bit of glop with a metallic after-taste. So, what is the application if we wish to distinguish Living Books from Twaddle? 1. I suggest that in order to strengthen one's ability to detect twaddle, to distinguish true works of literary value from over-processed, over-sweetened, bits of glop, try your own 30 days of daily reading of real literature- books that pretty much everybody agrees are living books, and no twaddle at all. For an easy list, try the books from AO's year 1-3. 2. I suggest further that one limit one's electronic screen time, including Kindles and other electronic reading devices (hear me out- I love mine. I just suggest a temporary fast), and definitely limit computer time as well (yes, even here), and social media. Just spend time with the classics. Even if you're only reading really good selections in picture books and children's fiction, I venture to suggest that at the end of the month you will have developed a taste for quality, as well as improved your ability to distinguish quality. In other words, off with the twaddle, in with the classics. Try this out for at least 30 days and see if you don't find yourself appreciating the living books more and detecting the twaddle more easily at the end. That sounds like a lot of effort though, and everybody has always told us we're good readers, right? So why should we bother? "In literature, we have definite ends in view, both for our own children and for the world through them. We wish the children to grow up to find joy and refreshment in the taste, the flavour of a book. "We do not mean by a book any printed matter in a binding, but a work possessing certain literary qualities able to bring that sensible delight to the reader which belongs to a literary word fitly spoken. It is a sad fact that we are losing our joy in literary form. We are in such haste to be instructed by facts or titillated by theories, that we have no leisure to linger over the mere putting of a thought. But this is our error, for words are mighty both to delight and to inspire... "Children must be Nurtured on the Best––For the children? They must grow up upon the best. There must never be a period in their lives when they are allowed to read or listen to twaddle or reading-made-easy. There is never a time when they are unequal to worthy thoughts, well put; inspiring tales, well told. Let Blake's 'Songs of Innocence' represent their standard in poetry; De Foe and Stevenson, in prose; and we shall train a race of readers who will demand literature––that is, the fit and beautiful expression of inspiring ideas and pictures of life..."
We want to reduce the twaddle in our lives, in our children's lives, because we want something greater for them and for ourselves. We want 'the fit and beautiful expression of inspiriting ideas. We want something living, sustaining, a new world, with an even greater sense of joy and wonder. Thank you for this excellent article. 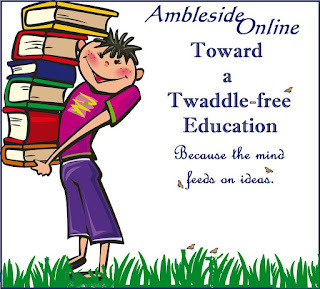 It helped me articulate my thoughts on twaddle in forms other than books. Great post Wendi!...and very timely, as I was reminded to schedule only the best of the best in our upcoming school year plan. I also linked your post to our blog today. BTW, how do you feel about the Catherine Vos Story Bible? Both the Vos and Egermeier Story Bibles have been favorites here. 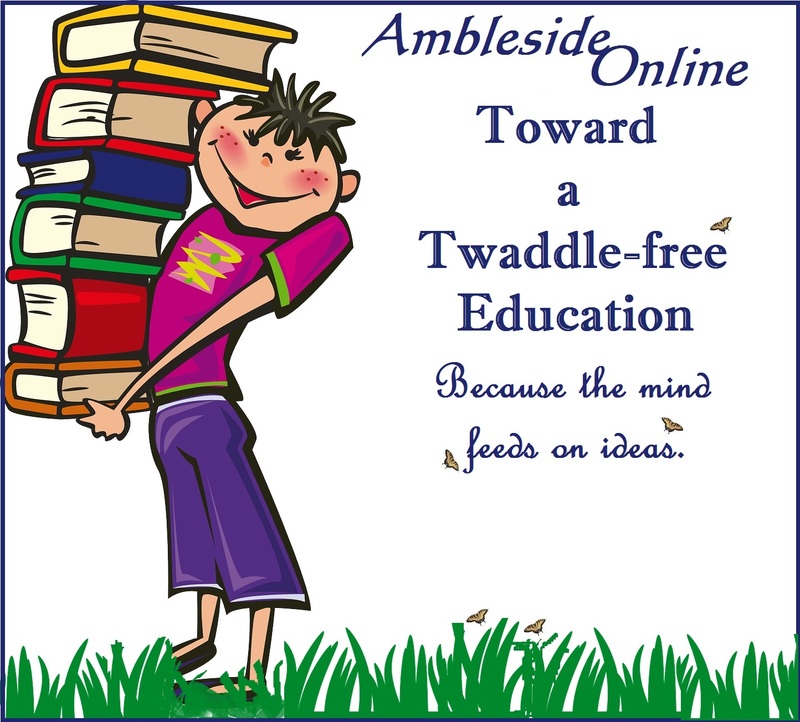 Do you consider them twaddle? 2nd EVER AO Conference coming this July!